It’s not uncommon for parents dealing with the ‘empty nest syndrome’ to set off on a new path in life. Loreen Niewenhuis, mother to one son in college with another soon to join him, decides to face this change in the family dynamic by taking on an exciting challenge. Like most people who live in west Michigan, Niewenhuis has a deep love for Lake Michigan. Looking for something that will test her physically, mentally and spiritually, Niewenhuis announces that she will walk around the perimeter of the fifth largest lake in the world. The book was inspired by Bill Bryan’s classic A Walk in the Woods, in which he hikes the Appalachian Trail. Beginning in Chicago, the trek takes her through Indiana, Michigan and Wisconsin, and ends where she started: Chicago’s Navy Pier. From mid-March to late September, Niewenhuis will walk 1019 miles through the four states that border Lake Michigan. At the age of forty-five however, she wisely elects to make this walk in ten stages or segments. For example, Segment One lasts five days and will take her from Chicago to Union Pier, Michigan. Segment Seven is ten days long and stretches from Escanaba to St. Ignace in Michigan’s Upper Peninsula. Most nights are spent in hotels or B&Bs, and she plans for several breaks during the year when she will return home to Battle Creek to rest and recoup. While Niewenhuis hikes through snow, rain and heat, and keeps a wary eye out for cougar and bear, this is not meant to be a record of endurance. 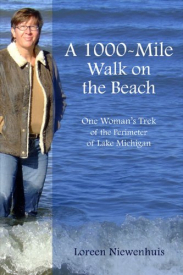 Instead it is simply one woman’s experience of setting off on foot and experiencing the beautiful and fragile ecosystem that is Lake Michigan. In fact, there are a number of friends and relatives – or curious strangers – that join her sporadically during her six-month long hike. Niewenhuis begins her trek on an unseasonably warm day in late winter. Standing at the end of Navy Pier in Chicago, Niewenhuis takes her first steps on March 16, 2009. I found her account of walking out of Chicago and through the industrial wastelands that border the lake’s southern bend particularly interesting. Many of us are accustomed to driving along this less than picturesque stretch of shoreline when traveling to Chicago. I had occasionally wondered what the area surrounding the shoreline here actually looked like. After reading Niewenhuis’ account, I need wonder no more. But she never lets the reader forget that the lake has been battered by polluters, and anyone who cares about the survival of such a magnificent ecosystem will find the book both disheartening and informative. At the end of the book, Niewenhuis includes a list of organizations dedicated to preserving the health and life of the Great Lakes. Whether you are a longtime fan of Lake Michigan, or have never set eyes on its clear, blue waters, you are certain to enjoy reading about every step Niewenhuis takes along its sandy and magnificent shores. Frederick Stonehouse’s Women and the Lakes is a nice companion piece to A 1000-Mile Walk on the Beach. Since Michigan maritime history largely focuses on the men who sailed, fished or protected the Great Lakes, Stonehouse’s book is a welcome addition to the history of these waters. And while most of us have heard of the occasional female lighthouse keeper, Stonehouse regales us with true accounts of women who not only kept the light, but of many others who captained their own ships, worked as salvage deep sea divers, or served on a number of lake vessels as the cook. Along the way, he treats us to rousing tales of heroics, daring and endurance. One such story features the female cook of the St. Clair. In 1888 the schooner barge St. Clair got caught in a storm on Lake Huron. A lifeboat was sent to rescue the crew, but the waters were so rough that everyone in the lifeboat remained in danger. As they rowed through the stormy night, someone had to hold the lantern out over the waves in order for the compass to be read. The lantern repeatedly was flooded and relit; such a task exhausted the men who tried it. The schooner cook Julia Greavreath then volunteered to hold the lantern aloft. Exhausted and frozen, Julia kept the lantern lit until dawn. When the lifeboat at last reached the pier at Port Sanilac, the waves overwhelmed the small vessel and five out of the 16 passengers on board drowned, including Julia Greavreath. The U.S. Life Saving Service released their annual report the following year, and praised the brave men on the lifeboat - but neglected to mention the brave woman as well. It is because of such forgotten women as Julia Greavreath that Stonehouse’s book is such a welcome addition to the history of the Lakes. Small wonder the extended title of the book is ‘Untold Great Lakes Maritime Tales’. 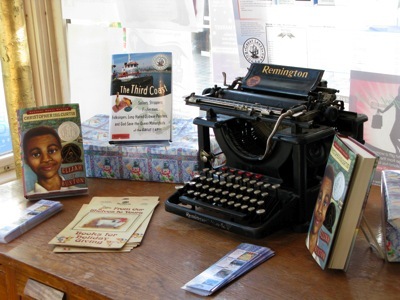 Stonehouse helps to rectify the gaps in the historical record, regaling us with fascinating tales of brave women such as ship captain Maud Buckley, diver Margaret Campbell Goodman and lighthouse keepers Harriet Colefax and Elizabeth Williams. 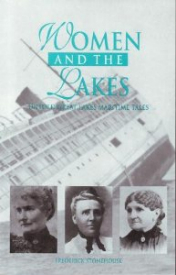 And for those who enjoy this book, remember to check out Stonehouse’s 2005 Women and the Lakes II: More Untold Great Lakes Maritime Tales . Award-winning British author Giles Andreae teamed up with illustrator Guy Parker-Rees in this amusing account of Gerald the Giraffe. 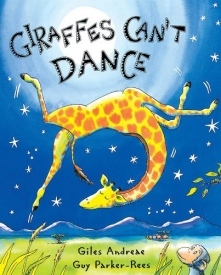 As charming as their other collaborations - The Chimpanzees of Happytown and K Is for Kissing a Cool Kangaroo, Giraffes Can‘t Dance is the tale of a giraffe who would love to join in at the annual Jungle Dance if only the other animals didn’t make fun of how clumsy he is. Even worse, Gerald believes they are right. Children will love the bright illustrations of waltzing warthogs, chimps doing a cha-cha, and rhinos who rock ‘n’ roll. Even better are the pictures of Gerald the giraffe as he finally kicks up his heels once a helpful cricket reminds him that anyone can dance “when we find music that we love.” Amusingly told in rhyming verse, Giraffes Can’t Dance is sure to delight your child and may even get them dancing before you’ve put down the book. If there is a children’s author/illustrator who creates more elegant and beautiful drawings than Jan Brett, I have yet to run across them. 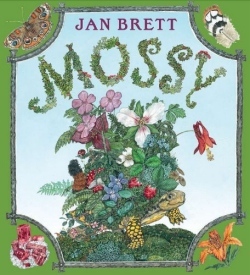 Not surprisingly, the award-winning Brett has done it again with her latest book Mossy. Set in Edwardian times, Mossy is the lovely story of a young Eastern Box turtle who lives in Lilypad Pond. Mossy so loves her pond that she never leaves, and soon finds moss and flowers growing out of the shell on her back. Carrying around such beauty attracts the attention of a lady botanist. Believing she is doing a wonderful thing, the botanist takes the turtle away to live in the viewing pavilion at the museum. Here she will be safe from hunger or predators and certain to live a long, healthy life. However Mossy is lonely and misses the pond, especially her turtle friend Scoot. All the visitors to the pavilion are dazzled by the wonderful garden growing on Mossy’s back. But one of those visitors is a young girl who wants to be a scientist, and she realizes what no one else does: Mossy won’t be happy until she is returned to Lilypad Pond, her natural home. She explains this to the lady botanist who is at first reluctant to lose the beauty that Mossy brings to the pavilion. But the child reminds her that there are other ways to share such beauty. The lady botanist sees the wisdom of this, and soon after has a painting made of Mossy showing her gorgeous turtleshell garden. With the painting of Mossy on display at the pavilion, the botanist and child return the turtle to her rightful home, where she is happily reunited with her friend Scoot. Mossy tells a sweet story which is accompanied by illustrations so richly drawn that both parent and child will want to spend a long time looking at them. Even better, its gentle environmental message will remind children to not take animals from the wild and make them pets. Mossy is sure to become a favorite with your child, and one that will find a lasting place on the family bookshelf.